Inspired by the destruction of the earth and armed with a new material in â€œmemory-polyâ€, the Toronto-based Ula Zukowska once again gives us wearable art. 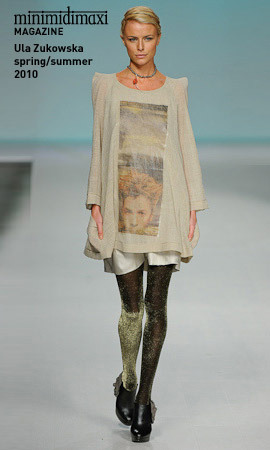 Knee-length tunics and dresses come in metallic earthtones of light sand, â€˜greigeâ€™ and tawny with indigo-tinged gradients, conjuring images of stone and rain in textiles by fabric futurist Junichi Arai. We see deliberate dollops of black not usually so prevalent in her spring collections. The general silhouette for this collection is emphasized hips and bare shoulders, but Zukowska also sculpts, crunches and pleats shimmery statements. Whatever the case, the outfits are light as gossamer yet deliver a message of strength, peeking through prints of faces and trees. Her deceptively simple dresses seem almost alive, floating away from the body with every movement, often in the bright sheaths of colour over bold prints. These pieces nod to the endless possibilities that come with warm weather, elevating and inspiring us to rekindle our tenuous links to our surroundings.